Though course materials at many universities have been migrating online, Jim Lyons doesn’t think students are very happy about it. “The students don’t really like to use PDFs as much because they find it tiresome to read,” says Lyons, manager of Print & Mail Services at the State University of New York (SUNY) at New Paltz. To help satisfy this demand, the 16-employee in-plant added a new a Sterling Coilmaster Jr. tabletop spiral binding machine from Spiel Associates in December 2017. Prior to installing it, the in-plant was binding course packs manually. Lyons notes that before Print & Mail Services added the Sterling Coilmaster Jr., he did a lot of research. 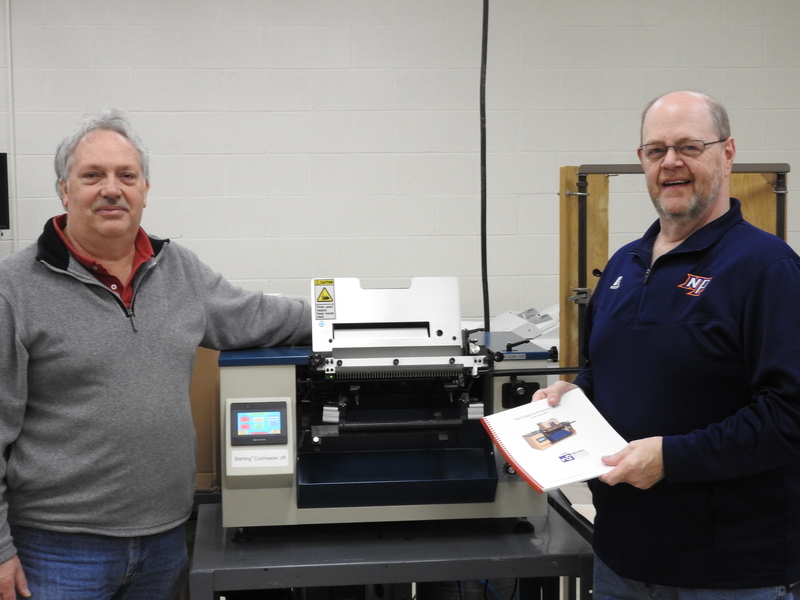 Alan Lenza (left) and Jim Lyons stand with Print & Mail Services’ new Sterling Coilmaster Jr. spiral binder, purchased to help the in-plant handle an uptick in course pack production at SUNY-New Paltz. Since adding the Coilmaster Jr., Lyons says that his customers are amazed at how quickly the in-plant can turn around their projects. Aside from course packs, direct mail still makes up a good portion of the in-plant’s work. The shop also produces stationery, NCR carbonless forms, directories, posters and signs for the campus. Print & Mail Services produces black-and-white jobs on its Ricoh 1107EX printer and color work on a Ricoh Pro C5110S full-color production printer. Speaking with Lyons, it’s clear that his passion to serve his customers and his enthusiasm for printing is contagious. In 2016, he was honored with the Chancellor’s Award for Excellence in Professional Service by his university.